By Ashwin Subramaniam and Yasmine Khater, who co-founded The Gone Cyclin’ Initiative. Gone Cyclin’ Initiative founders Ashwin and Yasmine embarked on a grueling 11-month journey to transport an idea to its final destination: funds to support women weavers and craftsmakers in Timor-Leste. Ashwin sees a documentary on the first Tour de Timor, a 410-km bike race through rugged and beautiful mountainous terrain. Struck by the hope of the Timorese people and the germ of an idea, Ashwin aims to participate in the next Tour in September 2011. Enroute to a climb of Mount Ophir in Malaysia, Yasmine discovers that Ashwin is in the same travel group. The simple act of sharing the idea begins to make the cause a reality, and gives it force and momentum. Co-founder Grace Chen and Ashwin work to find a beneficiary Timorese NGO and an organizational partner in Singapore to support the fund-raising logistics. Using the UN Integrated Mission for Timor-Leste list of Timor-based NGOs, Ashwin and Grace research each of the 315 organisations, finally choosing Timor Aid as beneficiary. This is the first leg of an uphill climb for the Gone Cyclin’ Initiative as fund-raising in Singapore is regulated by the Ministry of Community Development, Youth and Sports. Not a single dollar can be raised without a permit. “We approached 15 different organisations in Singapore for support, and got 15 rejections. This was the toughest challenge for us – more painful, more intense and more heart-wrenching than the brutality of that race through the mountains of Timor. But the rejections only deepened our conviction. The 16th knock is on the door of Rotary Club of Bukit Timah whose members instantly recognise the team’s potential. They adopt The Gone Cyclin’ Initiative as their full-fledged project, offering backing for the fund-raising logistics, and support for all future projects. As inexperienced cyclists facing the world’s toughest mountain bike race, the group undergoes a training program with cycling experts. This involves weekly gym sessions and long-distance cycling trips in Malaysia. With the support of Rotary Club of Bukit Timah, the Gone Cyclin’ Initiative pulls in five corporate sponsors including Air Timor, and over 120 individual supporters. 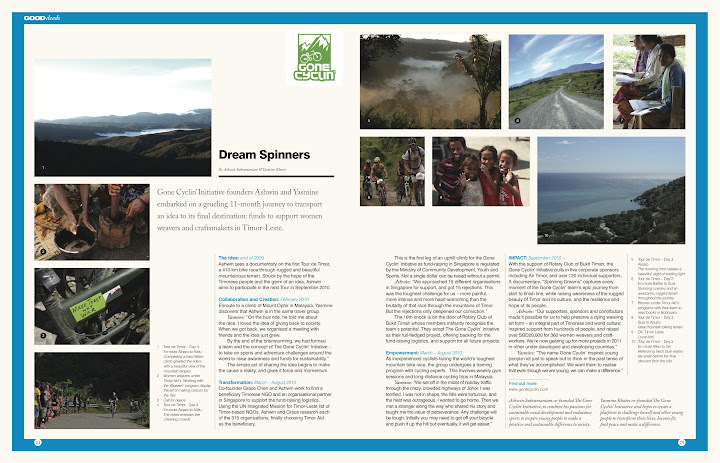 A documentary, “Spinning Dreams” captures every moment of the Gone Cyclin’ team’s epic journey from start to finish line, while raising awareness of the rugged beauty of Timor and its culture, and the resilience and hope of its people.